Why didn’t Nikon just call its non-pro line of cameras Nikons from the start? As they eventually learned, everyday people would pay for the cachet of the Nikon name. Yet Nikon insisted on calling its lesser SLRs Nikkormats (or Nikomats in Japan) in the 1960s and much of the 1970s. Those Nikkormats became more and more sophisticated over time. By 1972 Nikon had developed its first camera with an electronic shutter and automatic exposure, and gave it a Nikkormat name. Here it is, the Nikkormat EL. Large and heavy, the Nikkormat EL offered a reasonable complement of features. Its shutter operates from 4 to 1/1000 sec. It offers depth-of-field preview, mirror lockup, and a self timer. A stubby 6-volt 4LR44 (aka 476A, A544, and PX28A) battery powers it all. It goes in a slot behind the lens mount, under the mirror. Use the mirror lockup lever (left of the lens mount) to move the mirror up. Then lift the battery cover and insert the battery. I thought I’d have trouble seating the battery in that tight space but I snapped it right in with my index finger. The Nikkormat EL’s viewfinder is fairly big and bright and features an easy-to-read match-needle system for the aperture-priority autoexposure. There’s no on-off switch; to activate the meter, pull the winding lever back. The EL’s focusing screen offers a central split-image rangefinder ringed with a microprism. It works beautifully. The white button left of the viewfinder checks the battery. Press it in with your thumbnail. If the battery is good, the amber light glows. With this Nikkormat Nikon moved closer to the classic 1970s SLR idiom by moving the shutter speed selector to a dial atop the camera, next to the wind lever. (Early Nikkormats placed the shutter speed selector on a ring around the lens mount.) And as you can see, the EL takes films from 25 to 1600 ISO. 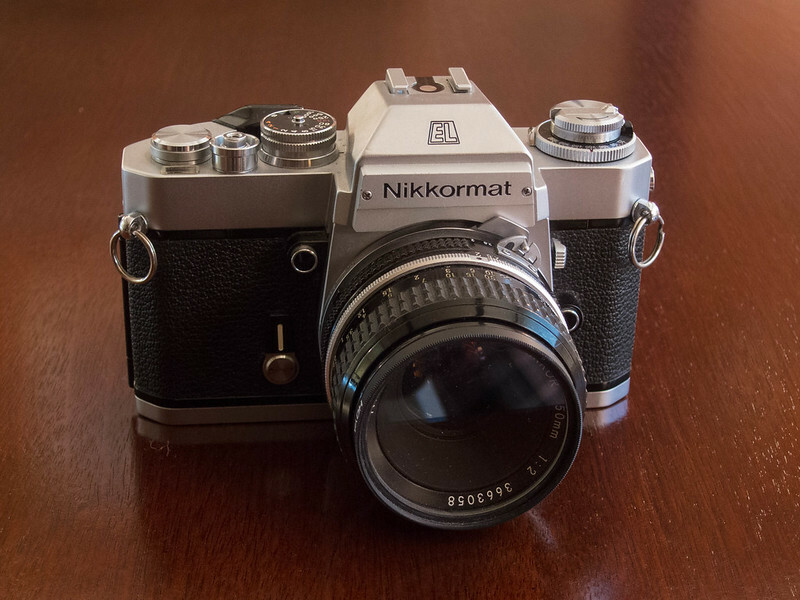 I’ve reviewed one other Nikkormat, by the way, even though mine carries its Japanese name, the Nikomat FTn. You might also enjoy my reviews of straight-up Nikon SLRs: the F2, the F3, the FA, and the N2000. You can see a list of every film camera I’ve ever reviewed here. Nikon finally got the clue when it updated this camera for 1977: it became the Nikon EL, the first Nikon SLR without removable prisms and focus screens. The Nikkormat line died quietly. This EL was placed on permanent loan in the Jim Grey Home for Wayward Cameras by John Smith, who generally buys his gear in top shape. The EL is said to be prone to electronic gremlins, but this one works fine. 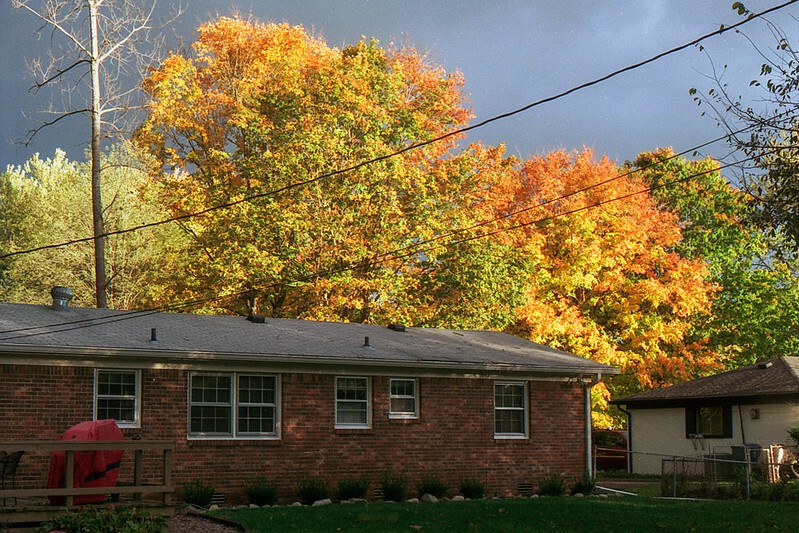 I dropped some Fujicolor 200 in, mounted my 55mm f/2.8 Micro-Nikkor lens, and got to shooting. I love to do close-up work and the Micro-Nikkor enables it so well. Yet it’s a fine lens for shooting things at greater distance. 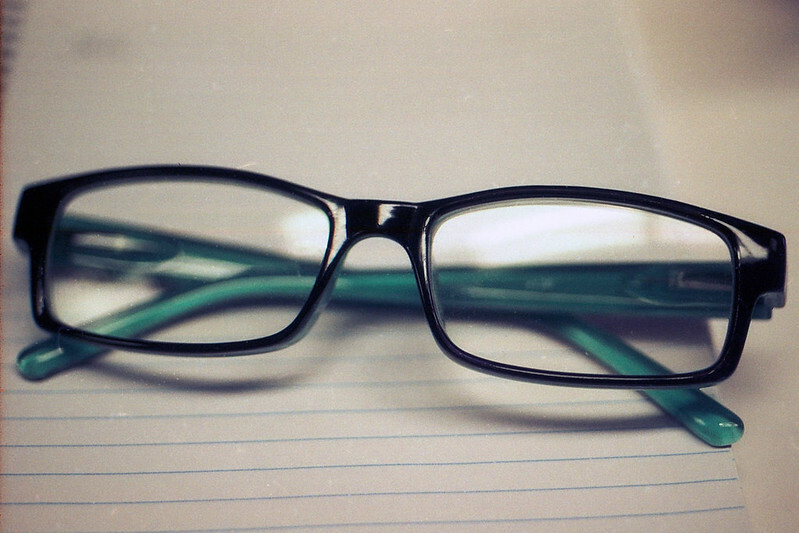 These are the reading glasses I keep on my desk at work. 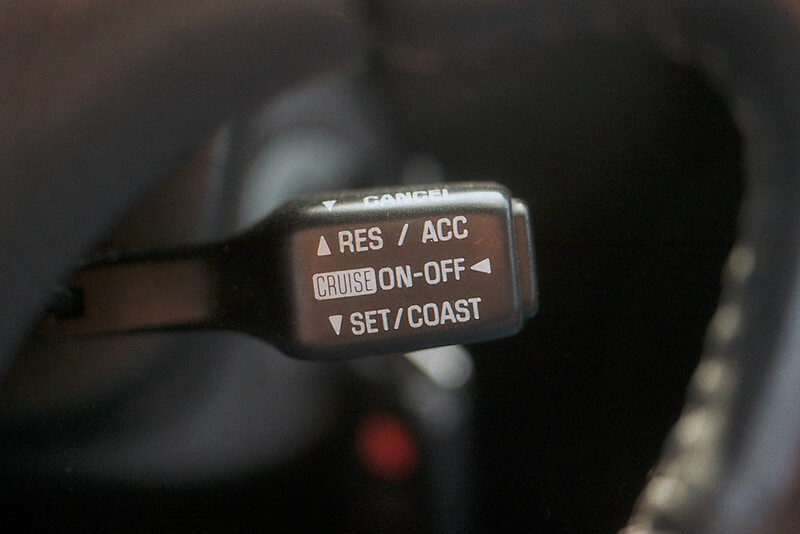 And here’s a gripping photo for the annals of all-time greats: the cruise-control switch on my Toyota. I love it that the Micro-Nikkor lens lets me contemplate details like this. I shot most of this roll around the house. 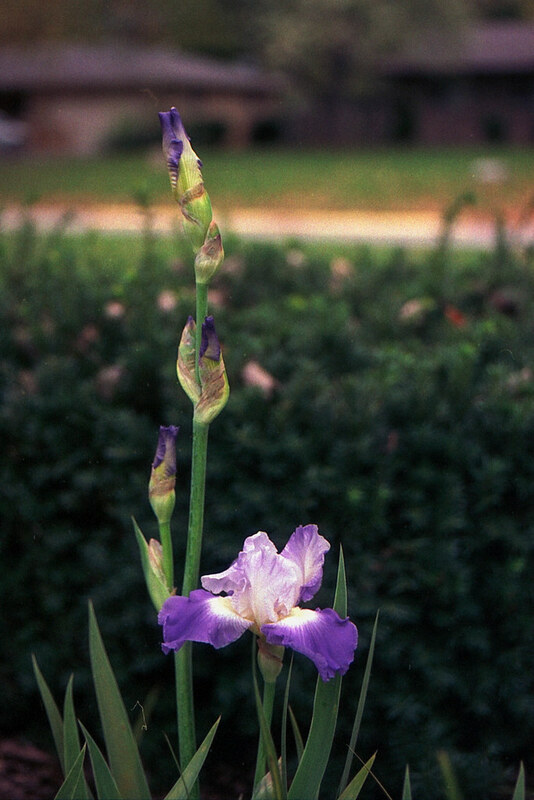 Last year I moved my irises to a sunnier spot, and this year they rewarded me by blooming in the spring and in the autumn. It was refreshing to see a splash of purple and white among the fall colors! Unfortunately, first frost came before the plant finished blooming, which did the remaining flowers in. We had some striking light one evening, so I went out to photograph it. This light lasted just a few minutes, before the setting sun and the clouds rolling in obscured it. How often do we get light like this but forget it because it is so fleeting? 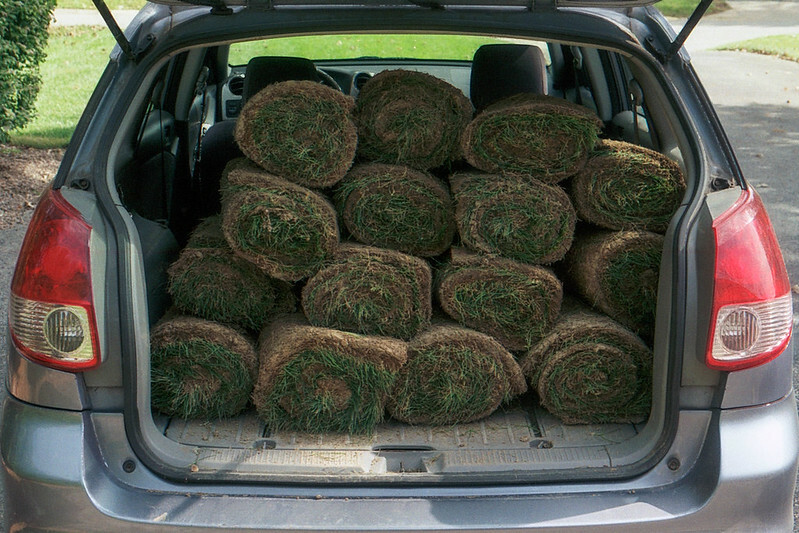 Showing that I had nothing but fine art on my mind while testing this camera, here’s my Toyota with a load of sod in the back. My Toyota has become an old beater, so it’s just right for dirty hauling jobs. Its plastic floor is easy to clean. 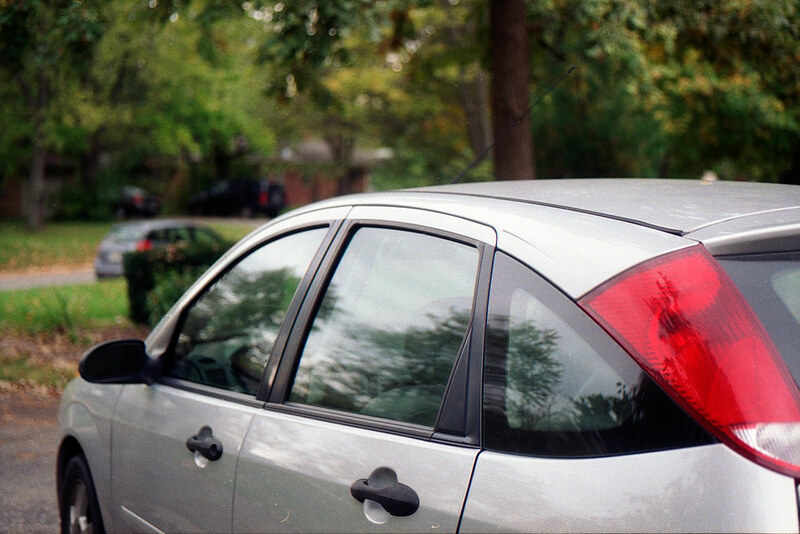 Finally, I got a nice photograph of my two cars with the Nikkormat. For more photos, check out my Nikon Nikkormat EL gallery. Metal, mostly mechanical 35mm SLRs are my favorite kind of camera, and aperture priority is my favorite way to autoexpose, so of course I enjoyed shooting with the Nikkormat EL. I didn’t enjoy shooting it any more than any of the other mostly mechanical 35mm SLRs I own, though. I suppose it says a lot about the general goodness of SLRs from the 1970s that a camera as capable and well made as this one doesn’t rise above the rest. Well done on the review of the Nikkormat EL. I really wanted a Nikkormat as a kid. I worked as a stringer for a local newspaper and all the staff used Nikons. For such an “old” camera the images and ability of this gear is still amazing. What’s fun about living in the modern era is that all those cameras we lusted after back in the day are inexpensive on the used market! Most of them, anyway. 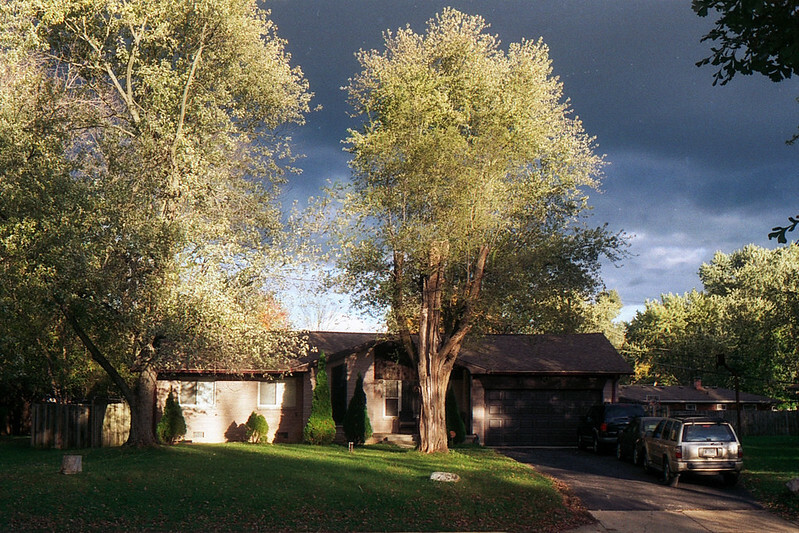 No way around it, Nikkormat’s were great. Every pro I knew had one or two, even if they only used them on the weekends. It seems like Nikon could do almost no wrong in the ’70s! I was just out shooting with my EL last Sunday! I mounted my older 20mm f:4 Non-Ai on it, loaded in a roll of Portra 160, and set the shutter dial to A. 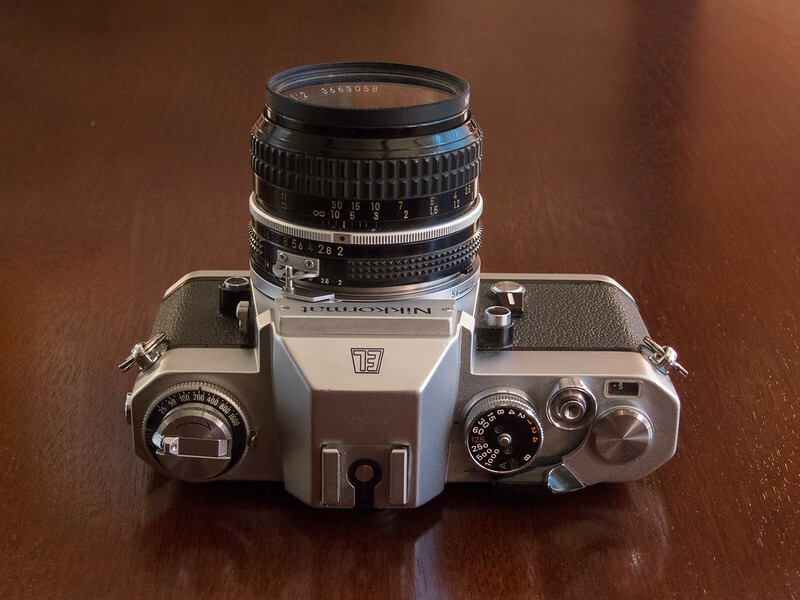 Other than the fixed prism, I think the EL might be my ideal 35mm SLR. The size is comfortable for my larger hands, the viewfinder works well even with glasses on, it takes an easy to find battery, and I can run it in Aperture Priority. If I need a waist level finder, like at car shows where I prefer a low angle, I pull out the F2. Oh wow, a 20mm lens, what fun! I like the EL, but I don’t see myself reaching for it very often. I like my Pentax ME too darn much. It’s not as smooth as the EL, but I love it anyway. 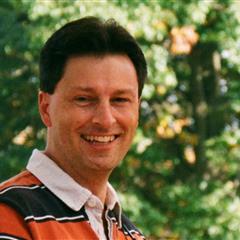 Jim, excellent review on an excellent camera! One of my favourite camera , and one of the best sounding shutter. I’ve encountered a lot of sentiment just like yours around the Internet. I had no idea people enjoyed this camera so much! I didn’t know till I used one ! Excellent! My nefarious plan is working! Hi Jim, I must have missed this first time ’round. Another good review, and funny. I just bought one of these, hot diggity, what a camera. I love it. Funny how everyone is different, Ive had no luck with Pentax at all and love the Nikon family… Thanks again. I just bought one for $49 this week. I am still on my first roll. My camera says Nikomat on it and I learned that is what was sold in Japan. I have never used a camera with a coupling pin. I will let you know how well the camera works. Ah, the coupling pin. A throwback to be sure. I look forward to seeing your results with your EL! Just today a like-new condition EL arrived from KEH, bought for not much money. I put a 50 mm f/1.4 on it and went out with a roll of Fomapan 100. Developed the negatives this afternoon and will scan them tonight. As a long-time Nikkormat FT (and more recently F3) user, I am really impressed with this instrument. I hope you keep and enjoy yours…I might have found a new favorite. These lovely Nikkormats sure can be had for reasonable prices. And they’re solid instruments. Good luck with yours! Somehow I missed this the first time you posted it. The answer to why Nippon Kogaku didn’t brand the first Nikkormats as Nikons is they were SO worried that anything less than their absolute best would somehow tarnish the reputation of the Nikon F.
Nippon Kogaku first dabbled in the consumer line of cameras with the Nikkorex series, but they outsourced the production of those cameras to Mamiya. For the NIkkormat, they thought that by giving them a unique name, that it would be obvious this was a different line of camera than the F.
But as you noticed, despite their best efforts, Nippon Kogaku was not capable of half assing anything, and the Nikkormats turned out to be outstanding cameras and actually became popular with pros as a backup body to the F.
They would continue using the NIkkormat name until 1976 when they released the Nikon EL2, which was just an updated Nikkormat EL. I did know Nikon was trying to protect the F. I just wrote an opening paragraph meant to draw readers in! 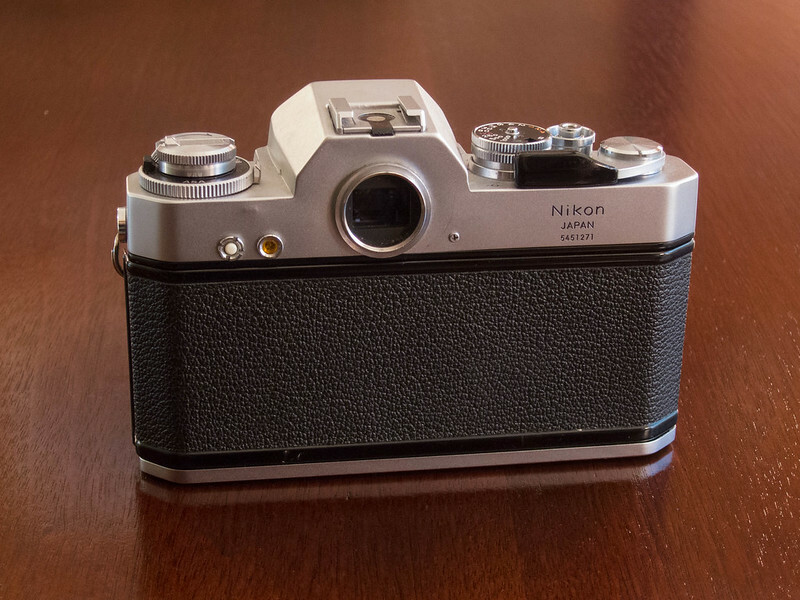 My first Nikon related camera was a new Nikkormat Ftn I purchased in the early 70s. I used it with a 35mm 2.8 and the legendary 105mm 2.5 for a few years and then sold it to help finance the acquisition of a used Nikon Ftn. I sold the Nikon a few years ago when I began shooting digital cameras. I began using the 35 and 105 again via adapters on my mirrorless Sonys. I also picked up a few more non-AI Nikkor lenses (24, 28, 200 and a few Nikon F mounts by Vivitar, etc. I also acquired vintage lenses from other brands. A few of these lenses came with film cameras attached so after a long hiatus I decided to shoot some film again. I found I really enjoyed reliving the joy I had shooting film and wanted to use the Nikkors with film again. As almost all of the Nikkors (except for the Series E 50mm 1.8) were non-AI, I decided to bypass converting the lenses by picking up a silver Nikkormat EL that also had a non-AI 50mm 1.4 attached. I then came across a black EL-W body at a bargain price that I couldn’t pass up. So far no electrical or mechanical problems. Both of these built-like-a-tank bodies shoot like they did when new almost 50 years ago. No worries about Nikon’s reputation here. They are middle-aged wonders and will never leave my camera collection. I have film in my FTn right now! It’s a beast. I have a 50/2 Nikkor H-C on it. I’m happy to hear you’ve picked up film cameras again. So much truly great gear was made in the 70s and 80s.